Happy December! 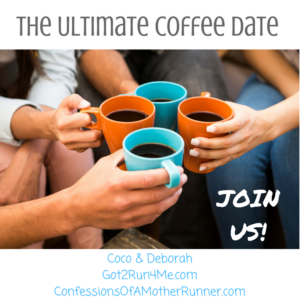 Since it's the first Saturday of the month, it's time for the Ultimate Coffee Date with Coco & Deborah. It's always fun to catch up with all of you on what's been going over a nice hot cup of joe (or tea, in my case this morning). The last Ultimate Coffee Date seems both like it was a long time ago and that it was just last week. Anyone else feel this way about November? Just me? How much to do you LOVE my new December mug? I love December - one of the greatest months of the year. :) It's like it's the last chance to make the year one to remember. I didn't really have any goals or intentions for this year, so there isn't anything to look back on to see if I've accomplished my goals, but it's still a fun time to reflect. Speaking of goals, if we were having coffee today, I would tell you that I've already started thinking about what I want to do in 2017! 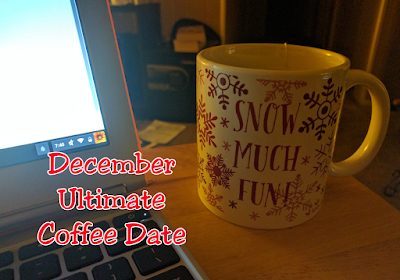 I'm still fleshing out my goals, so I'll wait to go into any details until closer to the New Year, but let's just say that I'm excited about them! If we were having coffee today, I would tell you that I have 4 more vacation days left to use at work. I still need to decide on one day to take off, but the other 3 are already planned for my anniversary, which because Christmas is on a Sunday this year means that I'll have nearly a week off Wed-Fri and then Mon for the holiday! Even though we don't have any plans yet, I'm excited to just relax and not worry about going into the office for a few days. I'm trying to convince Jeff that we should take a mini-road trip or maybe a couple day trips. Or at the very least spend some time outside. Or maybe just hanging out on the Strip for some people watching. We're on a pretty tight budget, so we'll see what we end up doing. If we were having coffee today, I would tell you that the #RWRunStreak has been going well. You can read more about it in my Week in Review post from last week (or stop back by tomorrow). Last month, I wasn't sure if I'd make a bigger goal with this streak, but I decided to make the goal running every day. I know, I know. That is always the goal of a streak, but my summer streak was running or walking - to avoid injury. This time, I'm combining the streak with a new Nike+ Run Club training program. The rest days of the training program are slow, easy runs with Sallie. With all her pooing, peeing, and sniffing, it takes about 13-14 minutes to finish a mile. 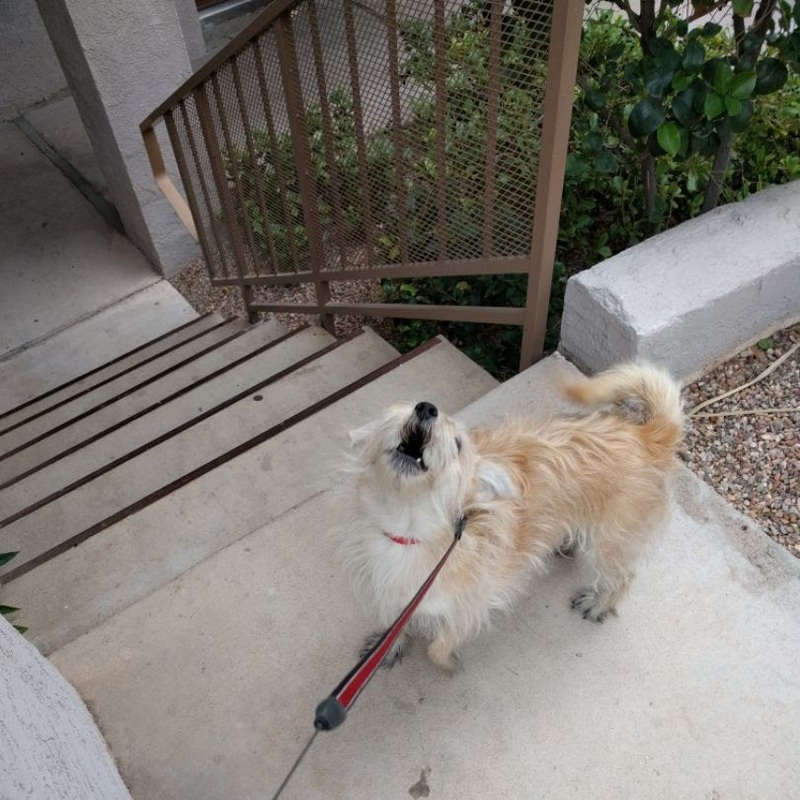 She's asking for her post-run treat. Finally, if we were having coffee today, I would tell you that I need a medal hanger for my race medals. Right now, about half of them are just thrown in a bag and the other half are all haphazardly hanging on one hook in my closet. I'm not normally a crafty person, but I'm hoping to make a medal rack like this one that I found on Pinterest. I love how it incorporates race bibs, too, because I have a LOT that are cluttering up a hallway closet. I'm enlisting the help of my crafty, running friend to help me with the project. Don't forget to head over to Got 2 Run 4 Me or Confessions of a Mother Runner and catch up with everyone else! What a fun medal rack!If you make one, be sure to post a pic, ok? Good luck with your run streak! I'm in the process of laying out my 2017-ish goals too! I do more of a 101 in 1001 thing so it tends to be the span of 3-ish years, but...close enough. :D Your dog is adorable! That medal rack looks awesome! Hope you get to make it! I feel like Pinterest breaks out the crafty person in everyone! :P Good luck with your run streak! The 101 in 1001 seems pretty ambitious. I love that medal hanger! What a cute thing- mine are also sort of stuffed in a drawer or stowed away somewhere! I love that this seems easy to make also! Enjoy your December- sounds like you are off to a great start! Thanks, Barrie! 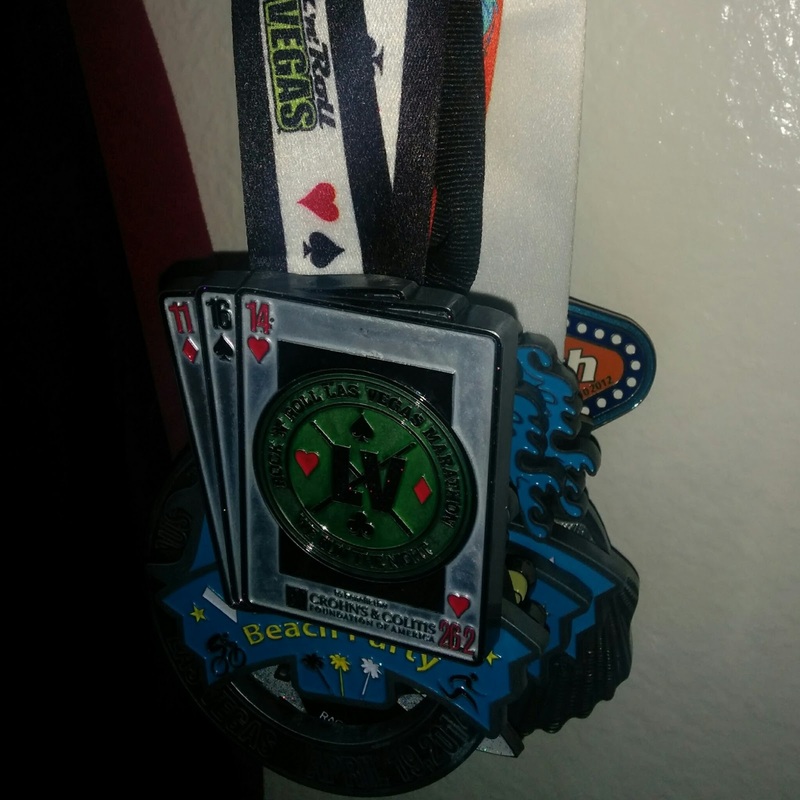 It's so easy to just throw the medals somewhere, but I'm excited to have a place to hang them. I mean, once I finish the project. I love the medal holder but even more, I love the use of the bibs on the letters! Looks like you'll be purchasing the Modge Podge for that project! All of you run streakers are making me want to tackle one ...maybe I'll make that part of my New Years resolution. Thanks for the inspiration! The use of the bibs was definitely the clincher for me on this project. I can't seem to throw them away, but need a place for them where they aren't just clutter. Oh, that's exciting that you know someone who successfully made a medal hanger. Gives me hope. I am excited to hear about your goals for 2017, especially since you are excited!!! Good luck on the RW run streak challenge. I did it once a few years ago and it was a great way to keep myself accountable. That medal hanger is fabulous!!! I need to get one, too. I have mine clumped together hanging from the upright foot of an upright ironing board. Not too glamorous, eh? Sallie is so adorable! Stay tuned for my goals when they come out and the finished medal hanger, too. Cute cup!!! like the look of snow but not the inconvenience of it. The DC area shuts down over a few sprinkles and it is ridiculous! Well I am excited to hear about your 2017 goals too!! I haven't started thinking about mine yet. Good luck on the RW streak...so impressive! I mean how cute is your doggy...I would spoil her with treats..lol!! I'm 100% with you on the look of now. It's so pretty, but I'm grateful to live in Las Vegas where I don't I have to actually deal with it. Congrats on the run streak, glad to hear it is going well. Also, cannot wait to see how your bib holder turns out. Thanks, Abby! I'll be sure to post pics of the medal/bib holder. I haven't done the RWRunstreak in a few years but it's definitely a great way to stay motivated to run! I need a medal hanger too but unfortunately I'm not crafty enough to tackle such a DIY project, but I look forward to seeing how it turns out! I'm not very crafty, either, but I'm hoping for the best with this project.